Ladies and Gentlemen, is that a pianoroll we see in the teaser screenshot ???? huhuhu ! this reveals a lot of the goodness that we will experience soon... just check it out !!! BLOCKS !!!! We are we heading at ? Well done, it seems like you are creating a very fine interface. This looks like THE killer sequencer for the Commodore64. We're right yeah Thomas ???? Just admire the pictures and try to calm down we're nearly there... For those who just heard about this, Prophet 64 is a series of synthesizer software for the Commodore 64. There are currently three editions, all MIDI compatible via DIN-sync (like the 303/606/808 etc) finally making it possible to use the C64 for contemporary music. 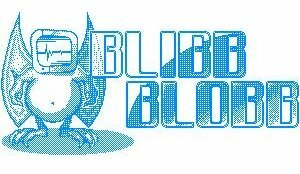 A bit techno oriented is this session recorded from Commodore 64c computers, turntable mixed by TMB of Scoopex who is running Blibb Blobb, a chiptunes podcast. 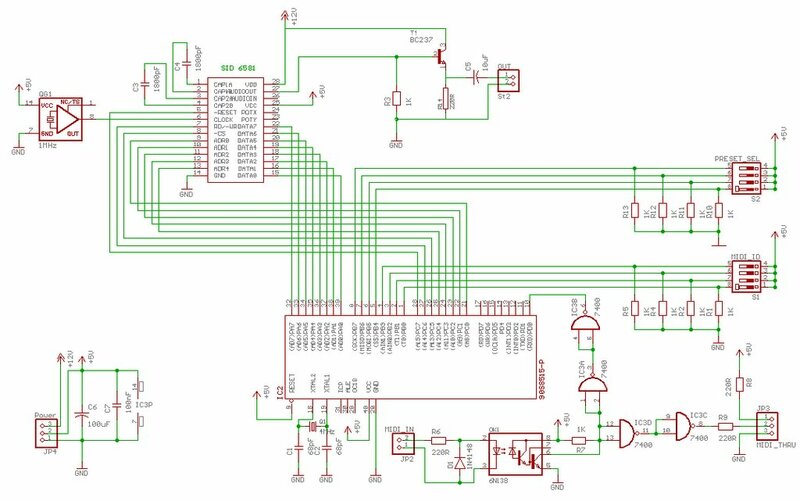 "...After my efforts of connecting a Commodore SID chip to the PC parallel port, i had several people asking how to interface that thing to a sequencer or keyboard. So i had to write some kind of MIDI loopback driver for it; but i did not like that idea and built a standalone box instead: the MonoVoice. My first idea was to make it 3-voice polyphonic beacuse it has 3 independent oscillators, but then i changed to the idea of a monophonic synth with a three-oscillator voice. The MonoVoice has many things you can control over MIDI: Oscillator detune, Oscillator waveshapes (separate and global), Filter parameters, 5 ADSR´s (one for each voice´s VCA, one for the global VCA, one more (software generated) for the filter cutoff), and some more. Because i do not have a decent MIDI controller knob box, i wrote a Windows program that can send those MIDI messages to the MonoVoice. It has the additional plus of 21 preset memories where you can store and recall your favourite settings. It also has a Randomizer for all those settings. The sequencer is a simple 8-step one that learns from keyboard input not unlike an SH101. For that purpose the Keyboard does have the additional "0" key to create pauses. 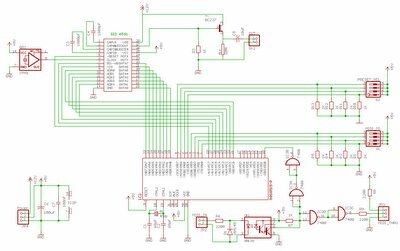 Warning to all people building stuff with the SID chip: the SID´s output is very delicate. I managed to zap 3 SID chips during development by simply inserting the cable from the MonoVoice into my amp´s jack - the extremely short short circuit duting insertion can do that. So use an opamp buffer to save your SID ! ..."
Battle of the Bits cross-platform remix competition! Tiny Sid 2 Compo started. 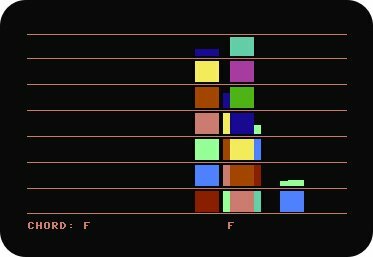 256, 512 and 1024 bytes tunes. C64 Orchestra: Rob Hubbard and Jeroen Tel will be arranging a performance of their classic tunes for a 12 piece orchestra , the Ricciotti Ensemble. SIDin magazine issue #09 released. del.icio.us/64 reaches the 500 links mark! Micromusic releases 15 new tracks. Josstintimberlake does C64 mentalism this month. 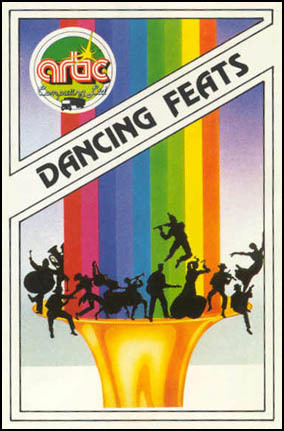 For our monthly retro software review column we selected Dancing Feats aka The One Man Joystick Band, one of the most insane piece of software we have ever experienced, just analyze that cover... what kind of band is that ? Actually we must admit that there is something about the GUI that we like...but anyhow, enjoy this total psycho software for a while and never let your kids play with it! Take a Commodore 64, Atari, or Coleco Adam, add a joystick and a program from Softsync, and you have created a musical instrument that can be played easily by nonmusicians. The program, Dancing Feats, is subtitled The One Man Joystick Band. Dancing Feats provides the backup, and you use the joystick to make a melody. The music rings out instantly, because there's virtually nothing—in terms of music—to learn. the decisions you make from a series of menus. 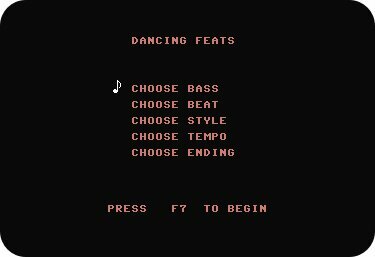 The main menu provides the following choices: Choose Bass, Choose Beat, Choose Style, Choose Tempo, and Choose Ending. For each of these choices, there is a submenu. For example, if you select Choose Beat, the submenu asks you to choose from Jazz, Rock, Blues, or Boogie Woogie. Go through the process for each of the main menu headings, and then you're ready to play. Dancing Feats follows your instructions and begins performing in its role as a backup band. It goes through a chord progression, playing in the style and tempo you selected. Your joystick provides the melody. As you push it in various directions, different notes are added to the composition. The program sees to it that the note you're playing is compatible with the chord being played by the computer. Pressing the fire button on the joystick will change the octave of the note you're playing. Once a song is under way, you play as long as you like. When you're ready to end your composition, press the space bar, and the program will begin to play the ending you selected before you began. The possible endings are The Duke, The Elvis, The Chance, and The Mozart. As you play, the screen displays a visual accompaniment to your music. Colored bars dance on the screen for each note you play. The positioning of the bars is relative to the pitch of the note being played. Low notes are displayed oh the left, high notes are displayed on the right. The screen also shows you what chord the computer is playing and what note you are playing. The program includes an a cappella mode, in which you can play melody without accompaniment. Dancing Feats does provide the user with a simple musical instrument, but there are some differences between it and a conventional instrument. With Dancing Feats, the musician is not in full control. You can't use your joystick to play Mary Had a Little Lamb or your favorite poptune. You can play only notes that are compatible with the chords the computer is playing. If, for example, you keep the joystick in the same position while the computer plays a C chord, you'll get the same note. But when the computer switches to an F chord, that same position on the joystick will play a different note. The music that results from Dancing Feats, while lively and enjoyable, cannot be composed note for note in the conventional sense. Nevertheless, Dancing Feats does provide nonmusicians or beginning musicians with the opportunity to learn something about music and music theory. For example, by experimenting with the options under Choose Tempo in the main menu, the user will learn the differences among adagio, allegretto, allegro, and vivace. Dancing Feats cannot hope to duplicate what might result from solid training and years of practice on a conventional instrument, but it certainly allows those who haven't had such training to make a little music that sounds pretty good. Children too young to tackle the intricacies of a violin or saxophone will enjoy the upbeat computer backup, and will be thrilled to make music many times more sophisticated than their dimestore xylophone can produce. review is taken from Compute! March 1984.
we warned you.. really really want to play with it ? ok ok you will find it here. 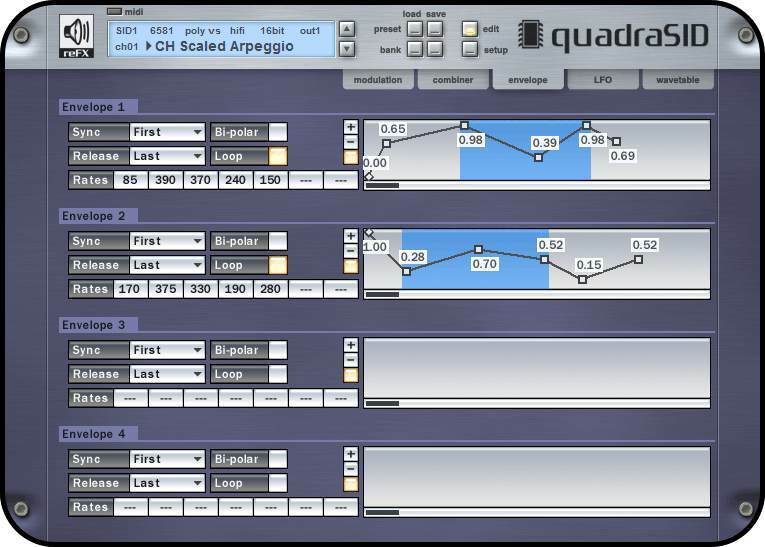 As you probably all know, QuadraSID is a VST/AU plugin from ReFX that emulates four SID chips. 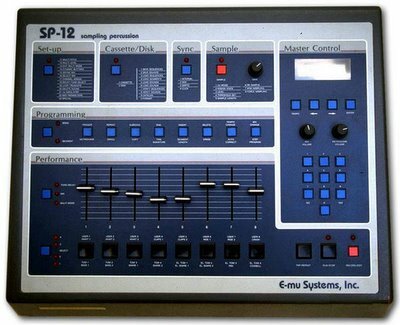 "..The SP-12 comes supplied with 24 drum samples stored in ROM. They are bass, snare, electronic snare, rim, 4 toms, 4 electronic toms, hi hats, crash, ride, claps, cowbell. An additional 8 user sample positions are available in battery backed up RAM for sampling into, but all 32 positions can use sampled sounds provided they fit in RAM memory . The samples are 12-bit linear at 27,500Hz, and there is a full set of sound editing controls on board for manipulating the samples. The machine is highly regarded in Dance and Hip Hop circles, for both its sound and beats. The base model maximum sampling time is 1.19 seconds (refered to as 1.2 seconds in the documentation). The Turbo model has quadruple this memory providing 4.76 seconds of sample time across 2 separate banks (a sample cannot span a bank). The documentation incorrectly refers to this being 5.0 seconds of sample time, although most factory sample diskettes only use up to around 4.2 seconds of sample time. The SP1200 uses a lower sampling rate of 26,040Hz. The SP-12 can store up to 100 patterns, 100 songs and has a 5000 note memory (4 times this with the TURBO model). It also has a mono mix output and eight individual outputs, MIDI in/out/thru, SMPTE sync, cassette/floppy disk storage and a metronome output. E-mu Systems introduced removable storage for the SP-12 by using an external Commodore computer diskette drive. This is a 5.25" self contained unit with its own power supply and a serial interface. It was the best choice in 1985, when 3.5" drives had yet to appear, and an internal 5.25" would have taken up too much room. The diskettes are used to stored samples and sequences..."